“New technique manipulates atoms into antiferromagnetic state. Physicists at MIT and Harvard University have demonstrated a new way to manipulate quantum bits of matter. In a paper published today in the journal Nature, they report using a system of finely tuned lasers to first trap and then tweak the interactions of 51 individual atoms, or quantum bits. The team’s results represent one of the largest arrays of quantum bits, known as qubits, that scientists have been able to individually control. In the same issue of Nature, a team from the University of Maryland reports a similarly sized system using trapped ions as quantum bits. In the MIT-Harvard approach, the researchers generated a chain of 51 atoms and programmed them to undergo a quantum phase transition, in which every other atom in the chain was excited. The pattern resembles a state of magnetism known as an antiferromagnet, in which the spin of every other atom or molecule is aligned. The team describes the 51-atom array as not quite a generic quantum computer, which theoretically should be able to solve any computation problem posed to it, but a “quantum simulator” — a system of quantum bits that can be designed to simulate a specific problem or solve for a particular equation, much faster than the fastest classical computer. For instance, the team can reconfigure the pattern of atoms to simulate and study new states of matter and quantum phenomena such as entanglement. The new quantum simulator could also be the basis for solving optimization problems such as the traveling salesman problem, in which a theoretical salesman must figure out the shortest path to take in order to visit a given list of cities. Slight variations of this problem appear in many other areas of research, such as DNA sequencing, moving an automated soldering tip to many soldering points, or routing packets of data through processing nodes. The work was performed in collaboration with Harvard professors Mikhail Lukin and Markus Greiner; MIT visiting scientist Sylvain Schwartz is also a co-author. Quantum computers are largely theoretical devices that could potentially carry out immensely complicated computations in a fraction of the time that it would take for the world’s most powerful classical computer. They would do so through qubits — data processing units which, unlike the binary bits of classical computers, can be simultaneously in a position of 0 and 1. This quantum property of superposition allows a single qubit to carry out two separate streams of computation simultaneously. Adding additional qubits to a system can exponentially speed up a computer’s calculations. But major roadblocks have prevented scientists from realizing a fully operational quantum computer. One such challenge: how to get qubits to interact with each other while not engaging with their surrounding environment. Some groups are building quantum systems with ions, or charged atoms, as qubits. They trap or isolate the ions from the rest of the environment using electric fields; once trapped, the ions strongly interact with each other. But many of these interactions are strongly repelling, like magnets of similar orientation, and are therefore difficult to control, particularly in systems with many ions. Other researchers are experimenting with superconducting qubits — artificial atoms fabricated to behave in a quantum fashion. But Vuletić says such manufactured qubits have their disadvantages compared with those based on actual atoms. Vuletić and his colleagues came up with a third approach to building a quantum system, using neutral atoms — atoms that hold no electrical charge — as qubits. Unlike ions, neutral atoms do not repel each other, and they have inherently identical properties, unlike fabricated superconducting qubits. In previous work, the group devised a way to trap individual atoms, by using a laser beam to first cool a cloud of rubidium atoms to close to absolute zero temperatures, slowing their motion to a near standstill. They then employ a second laser, split into more than 100 beams, to trap and hold individual atoms in place. They are able to image the cloud to see which laser beams have trapped an atom, and can switch off certain beams to discard those traps without an atom. They then rearrange all the traps with atoms, to create an ordered, defect-free array of qubits. With this technique, the researchers have been able to build a quantum chain of 51 atoms, all trapped at their ground state, or lowest energy level. 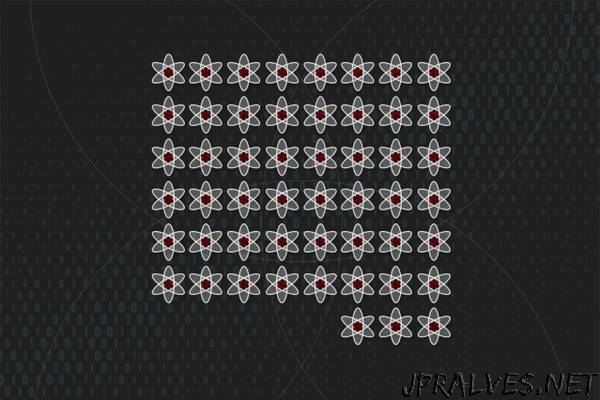 In their new paper, the team reports going a step further, to control the interactions of these 51 trapped atoms, a necessary step toward manipulating individual qubits. To do so, they temporarily turned off the laser frequencies that originally trapped the atoms, allowing the quantum system to naturally evolve. They then exposed the evolving quantum system to a third laser beam to try and excite the atoms into what is known as a Rydberg state — a state in which one of an atom’s electrons is excited to a very high energy compared with the rest of the atom’s electrons. Finally, they turned the atom-trapping laser beams back on to detect the final states of the individual atoms. The transition takes place only in every other atom due to the fact that atoms in Rydberg states interact very strongly with each other, and it would take much more energy to excite two neighboring atoms to Rydberg states than the laser can provide. Vuletić says the researchers can change the interactions between atoms by changing the arrangement of trapped atoms, as well as the frequency or color of the atom-exciting laser beam. What’s more, the system may be easily expanded. For now, the researchers are planning to test the 51-atom system as a quantum simulator, specifically on path-planning optimization problems that can be solved using adiabatic quantum computing — a form of quantum computing first proposed by Edward Farhi, the Cecil and Ida Green Professor of Physics at MIT. Adiabatic quantum computing proposes that the ground state of a quantum system describes the solution to the problem of interest. When that system can be evolved to produce the problem itself, the end state of the system can confirm the solution.